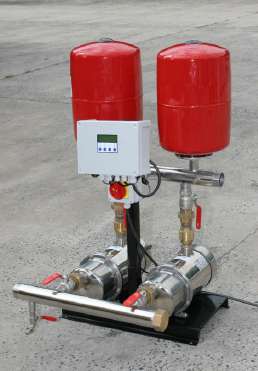 3P BPM series pressure booster sets are designed to supply water under pressure to multiple points of use. Multi-Point Pressure Control manages both the start and stop pressure of each pump, achieving high efficiency without the increased cost of variable speed sets, but with enhanced reliability, reduced component count, and lower cost. Pressure is measured at the outlet manifold by an electronic pressure sensor with greater reliability than mechanical switches. Features include adjustable pressure, duty standby/assist with alternation at each pump cycle, and BMS output, whilst remaining extremely compact. Pressure control is achieved by modulation of the pumps which are run as required to maintain pressure within a specified range. An optional level sensor probe can be situated in a break tank or Well and indicates the current water level, as well as providing an adjustable safety shut-off water level which can be adjusted from the control panel. BPM Series booster sets are controlled by the 3P Technik P Series Controller.